From Garsdale Station walk down to the main Hawes to Sedbergh road and turn right. Walk along the road and after a short while look for a stile on the left [just past the houses]. Follow the path diagonally up hill crossing a couple of stiles and downhill to Lunds footbridge crossing the railway. Do not follow the farm track but walk across the pasture towards the left of the houses. Bear left along the main road for a short distance and look for a stile on the right. The path goes diagonally across two fields and then enters Lunds plantation. The owners have recently felled the trees but the path is well marked although uneven. The owners have installed several bridges across boggy areas. The path emerges at a track. Turn right downhill to cross the River Ure on a foot bridge and immediately into Lunds churchyard [now disused]. Through the top of the church yard pass in front of the farmhouse and through a stile. Cross a footbridge and immediately start climbing uphill with Shaws ravine on the left. Adjacent with Shaws house a decision can be made. Either turn left and pass in front of the scenic waterfall [worth a look] and continue uphill to the track at the top - known as Lady Anne Highway - where it would be necessary to turn right and walk for 1/4 mile to reach High Dyke farmhouse - or climb diagonally up the hillside and directly to High Dyke. Either way proceed due East from High Dyke along a fairly well defined moorland path travelling uphill to reach Tarn Hill [541m]. Maintaining the same direction continue down hill through the recently felled forest aiming for the river at the bottom. Alternatively the forest tracks could be followed as a zig zag to reach the bottom. At West Gill Beck look for the vehicle bridge slightly upstream from where the path emerges. I imagine that there might have been a footbridge at one time but this has disappeared. Follow the path at the far side of the beck emerging between some farm buildings on the minor road serving Cotterdale hamlet. Turn right to cross the road bridge and then to follow the the right hand bank of the beck. 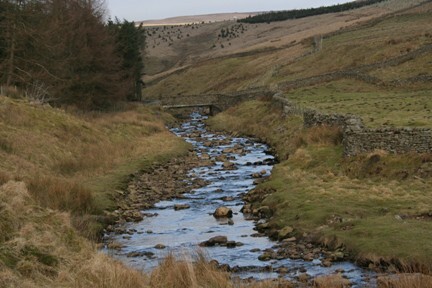 Follow the beck for no more than 1/4 mile and then bear right, slightly uphill to cross the minor road again. 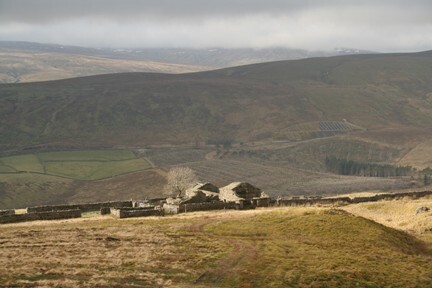 The path proceeds slightly uphill with the plantation on the right, crossing the crest of the hill and then down the other side to emerge at the rear of Thwaite Bridge House Farm. On reaching the farm turn right passing to the rear of the buildings in a westerly direction and the wall on the right. After a short while the path passes to the right of the wall through a stile. Continue following the wall, Cotterside plantation and through several fields to reach Yore House. 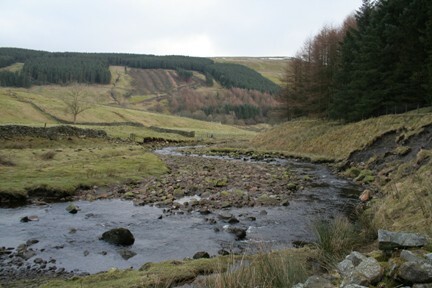 Pass through the farm yard and proceed along the farm track and over the River Ure. Immediately over the river bear left and cut diagonally along the new bridleway and to the rear of the Moorcock Inn. 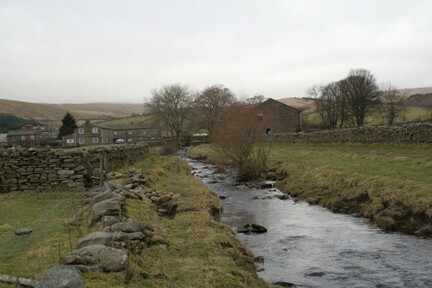 For the return walk to Garsdale Station, on leaving the Moorcock turn right and proceed along the main road towards Sedbergh for a very short while then turning left through a gate to follow the recently opened Pennine Bridleway which proceeds directly to the rear of the station passing under Dandry Mire Viaduct enroute. The station is slightly under a mile from the pub and 30 minutes should be allowed for this uphill walk! Remember that southbound trains run from the farthest platform and it is necessary to pass under the road bridge to gain access.